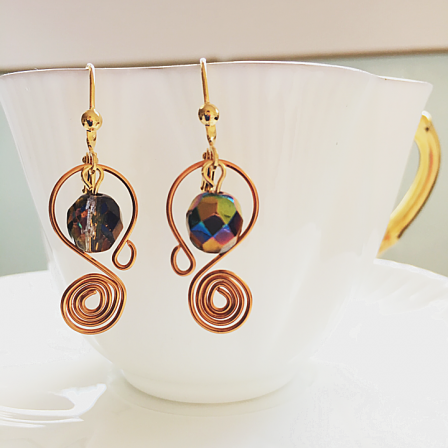 Bohemian style earrings made up of handcrafted wire spirals with Artistic Wire® (non-tarnished , permanent coloured wires) in natural copper, Czech glass beads and Swarovski crystals. Length - 4.2 cm. SOLD! 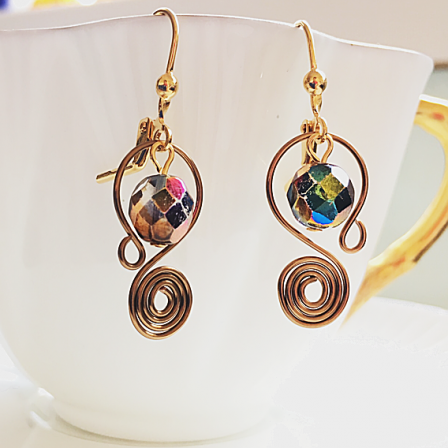 Bohemian style earrings made up of handcrafted wire spirals with Artistic Wire® (non-tarnished , permanent coloured wires) in antique brass, Czech table cut glass beads and Swarovski crystals. Length - 4.2 cm. 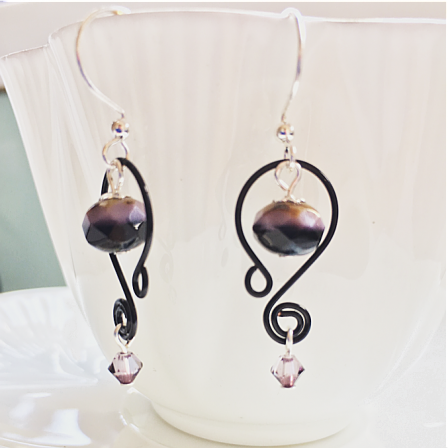 Contemporary & delightful, this pair of earrings are made up of handcrafted wire spirals with Artistic Wire® (non-tarnished , permanent coloured wires) in black, Czech fire-polished glass beads & Swarovski crystals. Length - 4.2 cm. 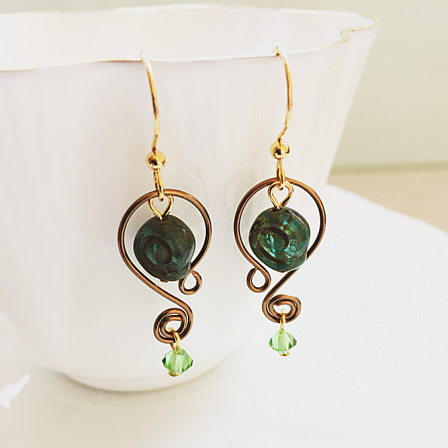 Vintage-inspired earrings made up of handcrafted wire spirals with Artistic Wire® (non-tarnished , permanent coloured wires) in antique brass and Czech fire-polished glass beads. Length - 4.2 cm. 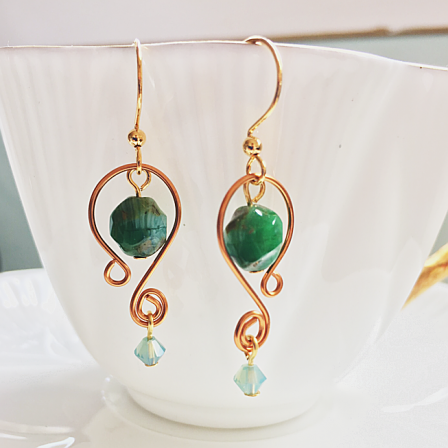 Vintage-inspired earrings made up of handcrafted wire spirals with Artistic Wire® (non-tarnished , permanent coloured wires) in natural copper and Czech fire-polished glass beads. Length - 4.2 cm. 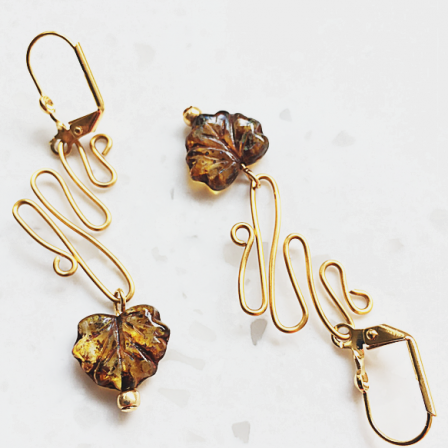 Bohemian style statement earrings made up of handcrafted abstract motif with Artistic Wire® (non-tarnished , permanent coloured wires) in gold and Czech table-cut beads. Length - 5.5 cm. 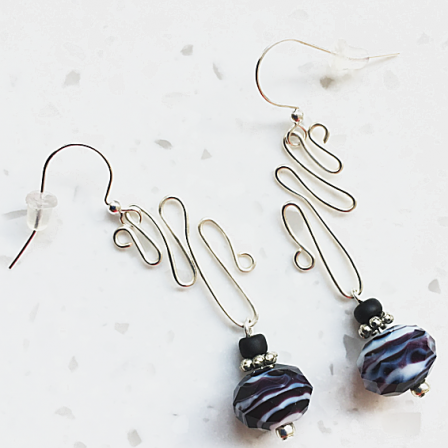 Elegant contemporary statement earrings made up of handcrafted abstract motif with Artistic Wire® (non-tarnished , permanent coloured wires) in silver and faceted glass beads. Length - 6 cm. 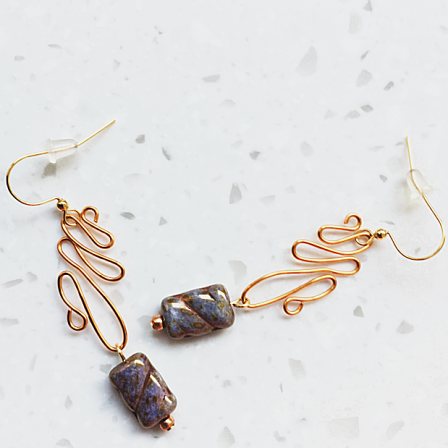 Bohemian style statement earrings made up of handcrafted abstract motif with Artistic Wire® (non-tarnished , permanent coloured wires) in natural copper and Czech table-cut beads. Length - 6 cm. 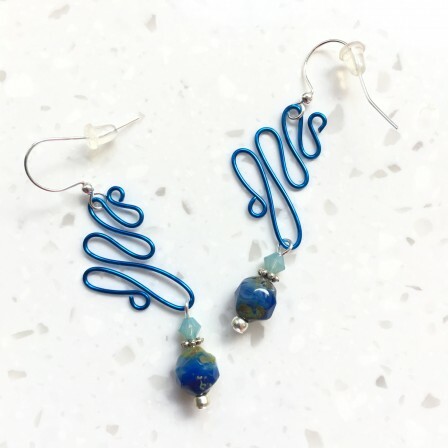 Contemporary delightful & fun statement earrings made up of handcrafted abstract motif with Artistic Wire® (non-tarnished , permanent coloured wires) in silver blue, Czech glass beads & Swarovski crystals. Length - 6 cm. 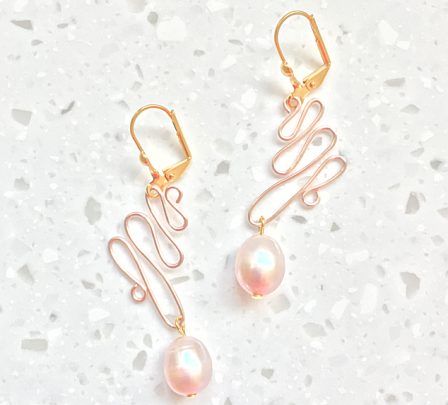 Elegant statement earrings made up of handcrafted abstract motif with Artistic Wire® (non-tarnished , permanent coloured wires) in rose gold and fresh water pearls. Length - 5.4 cm.